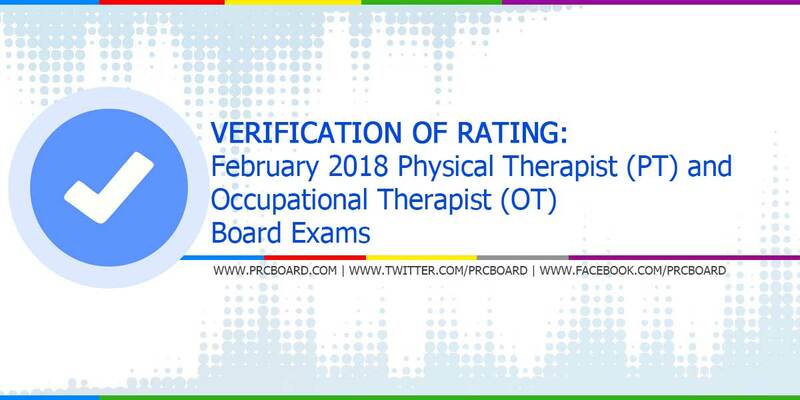 MANILA, Philippines - The verification of ratings and test results for the February 2018 Physical Therapist and Occupational Therapist licensure exams (PT-OT) given by PRC Board of Physical and Occupational Therapy will be available online few working days after the posting of results. Successful takers can refer to PRC official website and use the Verification Page to know their board examination passing rate. As posted, a passer shall only provide the exam name, the date of examination, the application number, first name and last name and the birth-date. If there is a suffix in the name, e.g. "Jr", this has to be added also in the first name (example: 'Juan Jr') to avoid 'no matching error' message. Passers of February 2018 PT-OT board exams are advised that the Professional Regulation Commission has fully utilized the online registration for issuance of Professional Identification Card and Certificate of Registration in Manila. The date of registration are provided in the main page together with official results. As posted, the date and venue of the ceremonies come few weeks after the release of board exam. To keep updated on related news and announcements about February 2018 Physical Therapist and Occupational Therapist Licensure Exams, we advise our readers to visit PRC official website or follow us at our social media accounts via Facebook and Twitter.